If you’ve followed our blog or looked at our gallery page, you’ll know that we think that stained glass belongs anywhere and everywhere in your home. It helps to brighten any space in the house and serves as both a functional design piece as well as a fashionable accessory that is guaranteed to spark a conversation. But if you’re interested in getting stained glass windows for your home in Las Vegas, and you’re not sure quite where you want them, we’ve outlined some of the best places to put beautiful new stained glass windows and doors in your home. Your front door is one of the most important focal points of your entire home, and its appearance can reflect that values and feelings that you want your home to express. For instance, if your door is a heavy solid door with no windows, it might exude an air of “keep out” and that’s likely not the tone you want to set for your visitors. You want your home to feel inviting, and a stained glass front door is a great way to express that sentiment. Stained glass allows for light to filter into your foyer or entryway and help it feel warm and welcoming. 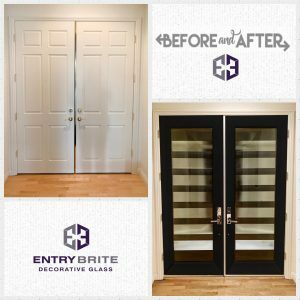 While you might want to use a solid door to maintain the privacy of some rooms in your home, adding stained glass to select interior doors is a great way to add elegance and grace to your home’s interior. For instance, a library or study is already a regal space, and adding stained glass to these doors allows ambient light from the rest of the house to flood into this space. It can also serve as a way to let others know you’re busy or deep in thought, as they can quickly glance into the room to check on you. Having stained glass windows in your doors throughout the house is also a great way to make a home feel more open. You can look through into hallways or even into other rooms, and your home will feel more connected. In many ways, the kitchen is the heart of any home. Even if you’re not actively making a meal or eating, it’s likely that you, your family, and your friends gravitate toward the kitchen. It’s a natural gathering place, and you’ll want to make it as comfortable and inviting as possible. Adding stained glass windows to your kitchen allows for light to flood into your space and create complex and fascinating patterns and colors that decorate your kitchen. You can fit all of your kitchen windows with stained glass, or select just one to serve as an accent piece that adds a visual appeal to your kitchen. If you’re using solid panel doors for the cabinets in your home, you’re turning each individual cabinet into its own kind of mystery box. Are your plates and bowls in that cabinet? Or is that full of glasses and fine china? Adding stained glass to your cabinets allows you to quickly identify what’s in each cabinet, while also serving as a way to decorate your space. For cabinets in other rooms, like living rooms and dining rooms, they also allow you to display objects and artifacts that you’re particularly proud of while still keeping them safely behind a glass barrier. Particularly if you’re pairing glass cabinet doors with stained glass windows or interior doors, you’ll find that the light plays across all of these surfaces in interesting and unique ways making any room more visually enticing. With more and more homeowners installing walk-in showers in their bathrooms, a stained glass wall in your bathroom makes sense. Not only is it a practical way to provide you some privacy while you bathe or shower, it’s also a way to effortlessly make a space more beautiful, especially since many bathrooms can be rather dull in their appearance. Adding stained glass to your bathroom walls can help transform your bathroom into a luxurious oasis, a space that you’ll love relaxing and spending time in. This is perhaps one of the most obvious places that would benefit from having stained glass windows. You already love your sunroom because of all of the wonderful sunlight that pours into the space. Now imagine how eye-catching your space will be with the introduction of stained glass. Your sunroom will be filled with color and complex shapes and patterns for an effect that simply cannot be matched. You’ll love how your sunroom looks when you have stained glass windows fitted throughout the space or in select areas. The fact is, there’s no wrong place to put stained glass. Whether as a tasteful accent piece to the top of a window frame or as an insert into an interior door, you’ll love the way stained glass makes your home look and feel. 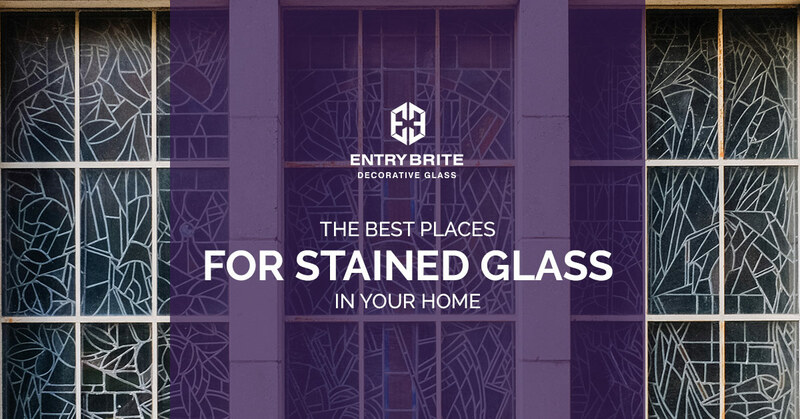 At Entry Brites, our stained glass artisans are proud of their work and want to share their craft with you and your home. Browse our gallery now, and then call us today to schedule a visit from one of our entryway remodeling experts.